Deeper exploration of the genetic changes that drive breast cancer is revealing new complexity in the leading cause of cancer death in women worldwide. In one of the largest breast cancer sequencing efforts to date, scientists from the Broad Institute, the National Institute of Genomic Medicine in Mexico City, Beth Israel Deaconess Medical Center, and Dana-Farber Cancer Institute have discovered surprising alterations in genes that were not previously associated with breast cancer. They report their results in the June 21 issue of Nature, which is publishing a series of papers characterizing the genomic landscape of breast cancer. One of the team’s new findings, a recurrent fusion of the genes MAGI3 and AKT3 in what is known as a translocation event, was observed in tumors from a rare but aggressive form of breast cancer known as triple-negative breast cancer. This cancer does not respond to conventional hormone therapy because its tumors lack three receptors that fuel most breast cancers: estrogen receptors, progesterone receptors, and human epidermal growth factor receptor 2 (known as HER2). But the biological pathway that is affected by the MAGI3-AKT3 reshuffling is already the target of experimental drugs. The other new alteration reported by the team occurred in two transcription factor genes. Recurrent mutations were detected in the gene CBFB and deletions of its partner RUNX1. Cancer-causing rearrangements of these two genes are common in blood cancers, such as acute myeloid leukemia, but their discovery in breast cancer marks the first time they have been seen in a solid cancer. The scientists studied two kinds of samples. 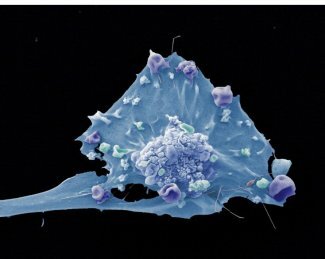 They sequenced the whole exomes – the tiny fraction of the genome that encodes proteins – of 103 breast cancer tumors and DNA from normal tissue from patients in Mexico and Vietnam. They also sequenced the entire genomes of 22 breast cancer tumors and matched normal tissue. Their analysis confirmed the presence of previously known mutations, but it also turned up the unsuspected alterations. The mutations in CBFB and RUNX1 point to the importance of understanding cell differentiation – how cells become specialized – and transcription factors that regulate that process of cell differentiation in epithelial tissue, which lines the inner and outer surfaces of the body. Further studies are needed to unravel that relationship, the authors concluded. For the current study, inspecting the novel fusion gene MAGI1-AKT3 more closely showed not only that the translocation can transform normal cells into cancer cells, but also that the protein produced by the gene is insensitive to certain drugs now in clinical trials, yet sensitive to others. In general, fusion genes are created within the same chromosome or across different chromosomes when parts of one gene join parts of another to become a novel gene that wouldn’t normally exist. Like the CBFB and RUNX1 mutations, translocations are also more common in blood cancers but until now have rarely been detected in solid tumors, especially breast cancer. This particular MAGI1-AKT3 fusion gene produces a fusion protein that acts in the PI 3-kinase pathway as an oncogene, or a gene that drives cancer, revealing a new target for potential therapy. The kinase pathway controls a multitude of cellular functions. When a gene is mutated in this pathway, the result is uncontrolled cell growth, a hallmark of cancer. Other gene mutations in this pathway are well-known, but MAGI1-AKT3 is a first. In laboratory dishes, tests confirmed that the novel structure of proteins encoded by the fusion gene provided no place for some drugs to bind but offered targets for other drugs. Once the mechanism at work in triple-negative breast cancer is understood through animal models, the next step would be to test chemical compounds to see how effective they might be at targeting cells that harbor this fusion gene’s protein. Beyond these scientific findings, the study also represents a closer look at the Latino population, thanks to the collaboration between the Broad and INMEGEN forged through the Slim Initiative in Genomic Medicine. INMEGEN scientists had previously built a large breast cancer study and then scientists at both the Broad and INMEGEN exchanged clinical, biological, and computational information. The study represented a first opportunity to study the genetic basis of breast cancer in Mexico. Larger studies will be required to determine whether differences in the spectrum of mutations exist between different populations, but this was an important first step toward that goal. Contributors to the work also include, from the Broad and its Harvard-affiliated hospitals: Shantanu Banerji (co-first author), Kristian Cibulskis (co-first author), Kristin K. Brown (co-first author), Scott L. Carter, Abbie M. Frederick, Michael S. Lawrence, Andrey Y. Sivachenko, Carrie Sougnez, Lihua Zou, Maria L. Cortes, Shouyong Peng, Kristin G. Ardlie, Daniel Auclair, Fujiko Duke, Joshua Francis, Joonil Jung, Robert C. Onofrio, Melissa Parkin, Nam H. Pho, Alex. H. Ramos, Steven E. Schumacher, Nicolas Stransky, Kristin M. Thompson, Jose Baselga, Rameen Beroukhim, Kornelia Polyak, Dennis C. Sgroi, Andrea L. Richardson, Eric S. Lander, Stacey B. Gabriel, Levi A. Garraway, Todd R. Golub, and Gad Getz (co-senior author). From Mexico: Claudia Rangel-Escareno (co-first author), Juan C. Fernandez-Lopez, Veronica Bautista-Pina, Antonio Maffuz-Aziz, Valeria Quintanar-Jurado, Rosa Rebollar-Vega, Sergio Rodriguez-Cuevas, Sandra L. Romero-Cordoba, Laura Uribe-Figueroa, Gerardo Jimenez-Sanchez, and Jorge Melendez-Zajgla. The research was conducted as part of the Slim Initiative in Genomic Medicine, a project funded by the Carlos Slim Health Institute in Mexico. The work was also supported by grants from the National Institutes of Health and the National Cancer Institute. The Carlos Slim Health Institute is a non-profit organization created in 2007 by the initiative of Mr. Carlos Slim-Helú with the purpose of generating solutions in order to help solving Mexico’s and Latin America’s main public health problems focusing on the most deprived populations. The National Institute of Genomic Medicine (INMEGEN) was founded in 2004 and became the 11th National Institute of Health in Mexico. INMEGEN’s mission is to contribute to the healthcare of the Mexican population by developing cutting-edge scientific research and well-trained human resources. The goal is to apply the knowledge of genomic medicine through innovation, state-of-the-art technology, and strategic partnerships, all the while complying with universal ethical principles. INMEGEN’s main research areas focus on principal complex diseases in Mexico, all based on the genomic characterization of the Mexican population. Examples of these areas are genomics of metabolic diseases (diabetes mellitus and obesity), cancer research, infectious and cardiovascular diseases, as well as nutrigenomics and pharmacogenomics. One of the features of INMEGEN¹s innovative culture is scientific research and development of technology, which leads to goods and services that can then be used to contribute to better health care for the Mexican people in the knowledge-based economy. Dana-Farber Cancer Institute (www.dana-farber.org) is a principal teaching affiliate of the Harvard Medical School and is among the leading cancer research and care centers in the United States. It is a founding member of the Dana-Farber/Harvard Cancer Center (DF/HCC), designated a comprehensive cancer center by the National Cancer Institute. It provides adult cancer care with Brigham and Women’s Hospital as Dana-Farber/Brigham and Women’s Cancer Center and it provides pediatric care with Boston Children’s Hospital as Dana-Farber/Children’s Hospital Cancer Center. Dana-Farber is the top ranked cancer center in New England, according to U.S. News & World Report, and one of the largest recipients among independent hospitals of National Cancer Institute and National Institutes of Health grant funding. Follow Dana-Farber on Twitter: @danafarber or Facebook: facebook.com/danafarbercancerinstitute.